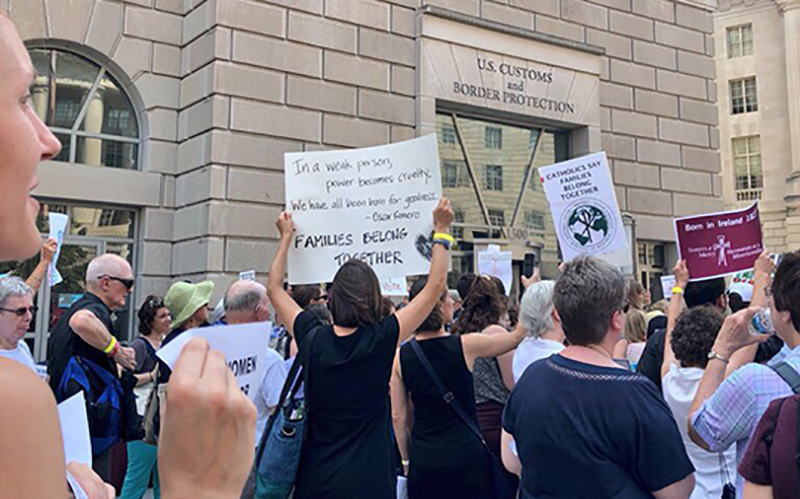 WASHINGTON – Democrats and immigration advocates rallied Tuesday against the Trump administration’s zero-tolerance policy that has led to the separation of families at the border, as immigration agency officials defended the treatment of children in shelters. It came as President Donald Trump headed to Capitol Hill to lobby House Republicans before an expected vote on a pair of GOP-backed immigration bills that the president said would end the family separations – something critics say he can do on his own. The policy of separating families is an outgrowth of the administration’s new zero-tolerance policy toward illegal border crossers, which refers those immigrants for criminal prosecution. In a call with reporters Tuesday morning, officials from the departments of Homeland Security and of Health and Human Services said that under current law they can only hold families for 20 days before they have to be released. Rather than do that, the government separates the families so it can hold the adults longer. Children who show up at the border unaccompanied or are separated from their parents can be held for 72 hours before being turned over to HHS for placement. Brian Hastings, an official with Customs and Border Protection, said in that call that 2,235 families were apprehended at the Southwest border from May 5 to June 9. Of the 4,548 people in those families, 2,342 children “became unaccompanied alien children under this initiative” – or were taken away from the 2,206 adults they were traveling with. Those separations have caused an outcry, as images of crying children and youth held behind chain link enclosures have circulated. The debate consumed Washington Tuesday, with a half-dozen protests, press conferences or conference calls held to blast the policy and demand change. 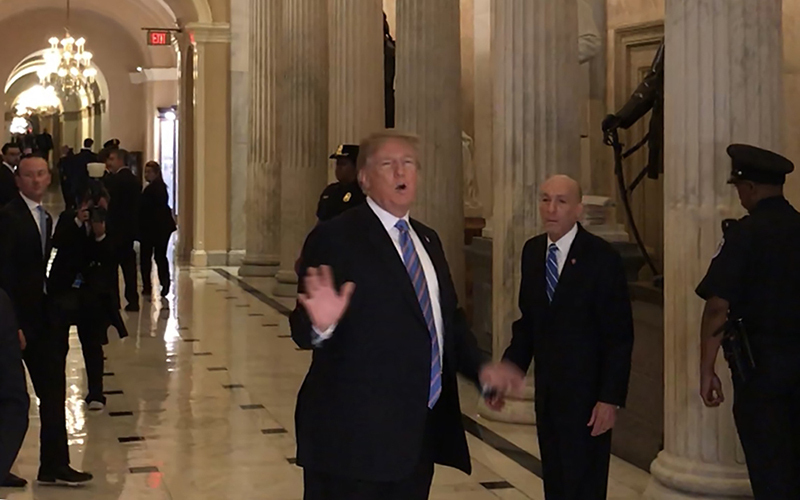 Members of the Congressional Hispanic Caucus confronted the president as he left the Capitol after an hour-long meeting with GOP House members Tuesday evening. “Don’t you have kids Mr. President? 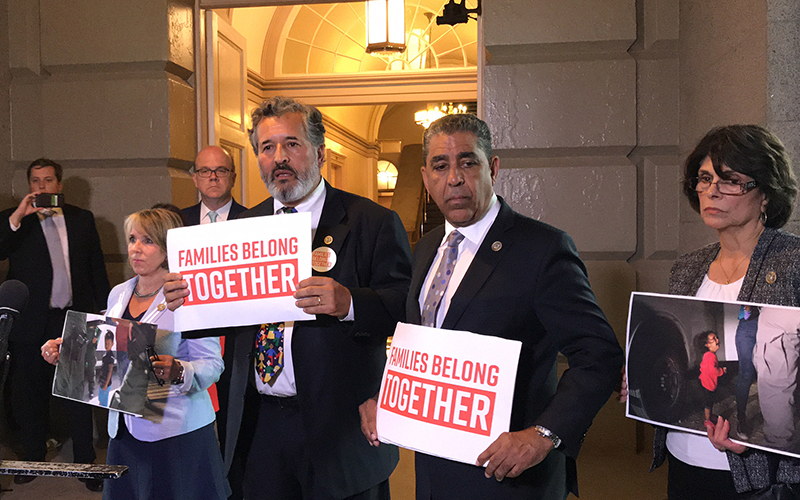 How would you like if they took your kids?” Rep. Juan Vargas, D-California, shouted as the president walked away. Trump and the GOP lawmakers talked about two immigration-reform bills that are expected to come up for a vote in the House as early as this week. Those measures – one co-sponsored by Rep. Martha McSally, R-Tucson, and another so-called compromise bill – were offered after House leaders beat back a plan by Democrats and some Republicans to force votes on a range of four bills from both sides of the aisle. The McSally-Goodlatte bill, for lead sponsor, Rep. Bob Goodlatte, R-Virgnia, calls for more border security, would curtail family migration and would eliminate the diversity visa program, which offers green cards through a lottery system, among other changes. Details of the compromise bill have not been officially released, but news reports have indicated that it will be more moderate. Supporters say both bills would end the child separation policy and find a permanent solution for recipients of the Deferred Action for Childhood Arrivals program, or DACA. Rep. Debbie Lesko, R-Peoria, said that she has signed on as a co-sponsor for the Goodlatte bill and is “working to solve this issue,” allowing children to remain with parents who are taken into custody. She blamed Democrats for blocking a solution. “Unfortunately, Democrats are unwilling to come to the negotiating table and work towards a legislative solution,” Lesko said in an statement emailed from her office. Other Republicans turned to the administration for answers. Sen. Jeff Flake, R-Arizona, and Sen. Susan Collins, R-Maine, sent a letter to DHS and HHS asking about the family separation policy, citing two cases where they said it took months for children to be reunited with their mothers. 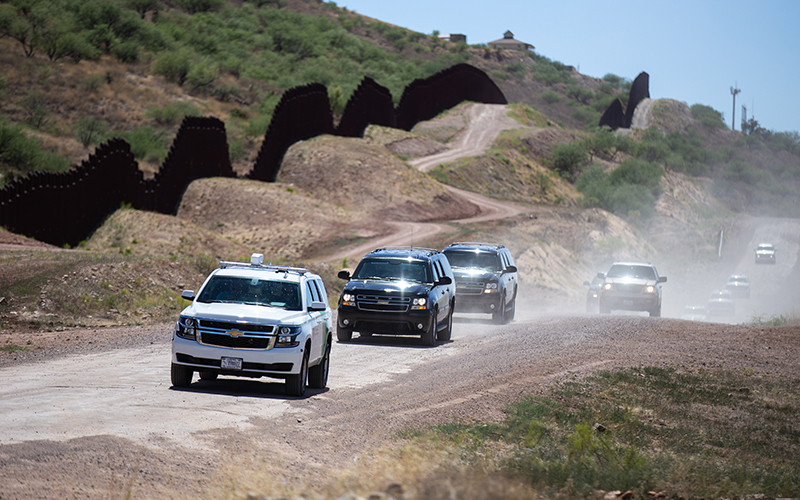 Poll shows 66% of Americans disagree with border policy: What do Arizona leaders say? “These accounts and others like them concern us,” the letter said. Steve Wagner, an acting assistant HHS secretary, said in the conference call Tuesday morning that the department is still figuring out how to reunite separated children with their parents. While photos of tent shelters and recordings of distressed children calling for their parents grabbed headlines this week, Wagner reiterated that “unaccompanied alien children” are treated well in the care of the department. Wagner said that children under age 13 are not kept in the highly publicized tents in Tornillo, Texas, which he called “soft-sided shelters,” though he did not elaborate on the conditions children face in the tents.